Richly decorated with saturated colors and hand-painted tiles traditional to Mexican design, Casa Linda is as welcoming and comfortable as being in your own beloved home. Nor will you be short on privacy, since the first bedroom is downstairs, next to the pool and the second bedroom is upstairs in a darling “granny flat” unit. We also love that it is just steps away from our famous malecón beachside promenade, as well as a few blocks from our most beloved local restaurants. My name is Monica. I grew up in Ciudad Obregon, Sonora, and have lived La Paz for the last six years. During that time, I've grown roots into the community through educational programs and efforts to advance environmental conscience in the form of organic gardens, recycling, and sustainable water-management practices. Casa Linda is not an impersonal “house” but rather a true home, full of warmth and character. It’s so cute my daughter-in-law wants to steal it!!! Traditional ceramic floors and intricate murals cover the well-lit, rustic rooms, all of them vibrant with the colors and textures of Mexico. The kitchen, dining room, and living room together create one large common space. 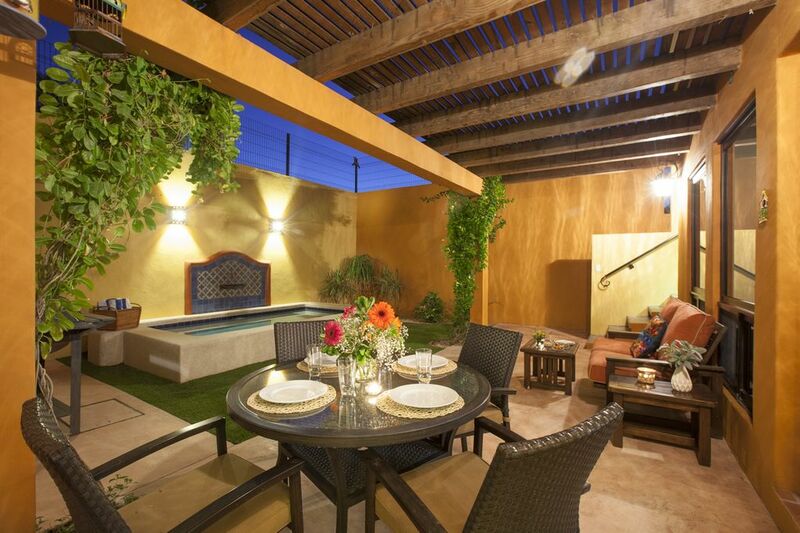 It opens up into the backyard terrace and pool area, which can be independently accessed through the master bedroom. The backyard “granny flat,” which sports its own kitchen, affords the possibility of housing an additional party—friends, children, or the in-laws—providing the privacy of their own environment, while keeping the proximity one gets by sharing a house. Casa Linda has a very spacious garage with an electric door, easily capable of fitting two SUVs. It has a fully furnished independent second floor apartment accesible by stairs. Guests have access to all areas of the house, including the bedrooms, granny flat, kitchen, living room, dining room, backyard terrace, pool area, and laundry room. There are air conditioning units in every room of the house. We take pride in using non-toxic cleaning products for our housekeeping service, providing a healthier and more natural alternative, while being just as effective to synthetic-based conventional cleaners. As La Paz doesn’t have a city recycling program, we go the extra mile and arrange for recycling ourselves. We offer recycling bins for our guests, which we then transport to proper recycling facilities outside of town. We are making efforts towards water conservation in La Paz. We are adopting water-efficient technologies, growing mostly native vegetation in our decorative gardens, promoting responsible water usage, and building urban rainwater capture basins. Finally, we provide canvas grocery bags you can use in your trips to the local stores, farmer’s and fish markets. Each room is equipped with its own A/C unit. Sheets, pillows and blanket provided. One extra set of linens is provided as well. Four bath towels are provided for every room. Included in the rental price is a full gas tank for the kitchen and a full gas tank for the pool. If you require additional gas during your stay we can provide it for a fee. Casa Linda - well named! Our family of 4 truly enjoyed our stay in La Paz. La Casa Linda is very well situated, 2.5 blocks to the Malecon, and within a safe walkable neighborhood that allowed to explore the city on foot. The house is truly beautiful and well maintained. During the heat of the day, it was so nice to escape back to the house and jump in the small pool. Ana Carolina was there to greet us and send us off. Her recommendations of places to eat and shop were priceless! She was responsive to all our needs. We would love to return again to this house in future visits to La Paz. Casa Linda checked all the boxes! We stayed at Casa Linda whole in La Paz. It is located in the heart of downtown and was within walking distance of the Malecon, coffee shops, and fabulous restaurants! Ana was amazing! I became sick during our stay and she arranged for a doctors appointment and even translated directly to the doctor. We will definitely be back to Casa Linda! The house was beautiful and bigger than expected. We used the hot tub every morning and every evening. Exceeded our expectations! Thank you so much for your review! we appreciate it a lot. We are so glad you enjoyed your stay and you liked the house. And I am very happy Ana was there to help you with your doctor´s appointment. She is the best! I hope you are feeling better. Very close to the beautiful boardwalk, only 2.5 blocks away.